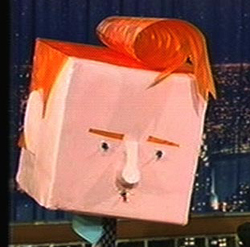 What Makes Conan O'brien Caricaturable? this months newsletter will superficially be about caricaturing late night T.V. 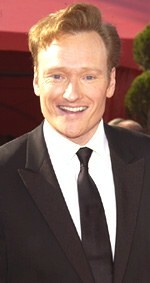 and comedic improviser extraordinaire Conan O'brien. I mention improviser because that's what Conan is and that is exactly what you are as a caricaturist: an improviser. You take what you're given, you react and you remain honest to your gut reaction. As a comedy actor / improviser you react with some sort of gesture: you make a facial expression, you blurt something out of your mouth, your body contorts. As a caricaturist, you draw a line on the page. See, you're an improviser. And this is especially true at gigs. The extra pressure of working a gig actually makes it easier to make that mark on the page: because you have to. It's so much easier to waffle and even avoid drawing altogether while you're in the safety of your home. But I'm not here to talk about that today :-) I'm here to keep it simple. Sort of. 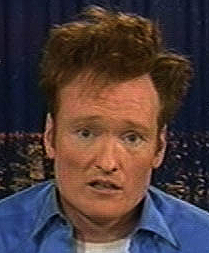 Yep, I'm here today to walk through what makes Conan O'brien caricturable. And I'm not even going to draw a caricature. Maybe next month. I also say superficially when I mention caricaturing Conan O'brien. We're going to go through a rapid fire review of using comparison when caricaturing. "Compared to what?" you're probably asking. Well if you're a YouCanDraw.com veteran this'll all be review. And you also know it's good form to review and rehearse those basics. OK, that still doesn't answer the question of "compared to what?". Well, let's go down the list: compared to Mr. Average, compared to Bill Maher, or Ani DiFranco. Compared to anyone. It's when you compare one person's look, their visage, their face to anothers, it begins to become clear - or at least clearer - what makes them unique. Getting something to compare to in your head, or better, emblazoned on your brain, like the proportions of a Mr. Average allows you to have at the ready a small bank of measurement you can rapid fire run through to size up your victim. (Sorry about the huge run-on sentence there.) Hang on now, we're going to blaze through this just like you were at a gig. So let's dive in. Boyish good looks, the poster boy picture of Irish-American optimism, healthy, a guy truly enjoying his life. Trademark big hair. Where do you start? Probably not with the hair, but we will make a note that we need big hair, a real flame of a tuft of hair at that. Another thing we can note is the overall shape of the head: Mr. O'brien has an amazingly square head. He makes fun of that all the time himself - and the relative pure size of it. Ok. Is that enough to get started? Well I'd note it along side the big hair and hold off drawing just for another second. where do you place the eyes when you start drawing on the paper? OK, start with the eyes. 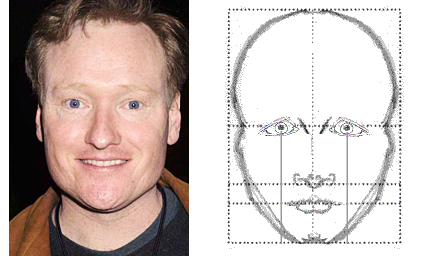 How to draw Conan's eyes? After drawing in the dark of the irises, I'd be moving on to laying down lines for the nose. I'd start at the root of the nose (right between the eyes), and extend that down to the tip / bulb / nostrils of the nose - and mostly by laying down shadow shapes. OK, what's all this confusion about? (In the picture above.) Well, to make sense of this picture, let me tell you what I'm comparing. 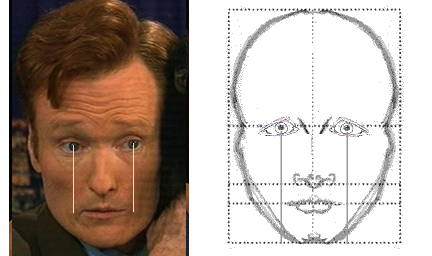 If you start with the Mr. Average head on the left, the yellow lines roughly compare the distance between the middle of the eyes and the bottom of the nose. They're proportionate in this comparison. 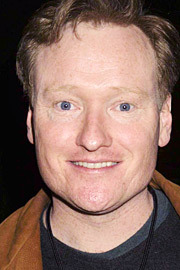 But look what happens to the distance between the bottom of the nose and the upper lip: on Conan, this space is a lot narrower. Now I aligned / sized Conan and the Mr. Average on the right by eyes and chin. This distance is the same - but look how the different features (mouth and bottom of nose) line up. 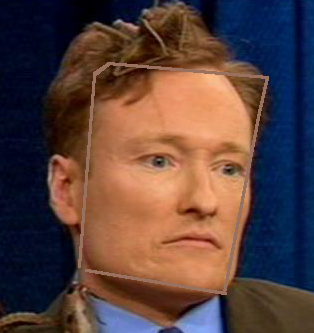 This time Conan's mouth lines up a bunch higher on the face compared to Mr. Average. (I also realize that the "Mr. Averages" aren't even the same - the one on the left is a little wider). 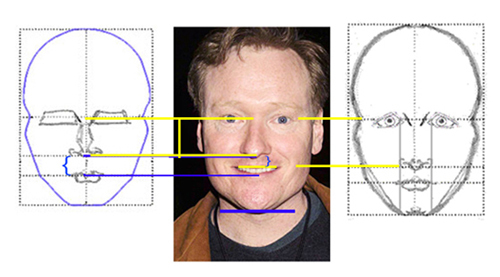 Again, the blue lines on the left hand Mr. Average compare the space between the bottom of the nose and the top of the lip (the blue line from the left hand Mr. Average to Conan's bottom of nose is partially obscured by the yellow line...look close). How do they compare? 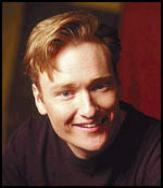 The gap between Conan's upper lip and the bottom of his nose is narrower when compared to Mr. Average. Compare this same space with the Mr. Average on the right. Same deal. So what would you do when drawing this? That would cue me to start cramming together the bottom of the nose and the mouth. Starting to get the idea? This should be review -- (we've gone to ridiculous detail in the book about Mr. Average in the main section on Shapes of the head and in the Ani DiFranco in-depth lesson. You can also review this and and run through a unique, one of a kind Flash exercise on internalizing these Mr. Average proportions. The differences are subtle! But this is the core of drawing faces, portraits, and caricatures: honing up your powers of observation to a very high degree. What did you come up with? What do you get when you square up Conan's chin with Mr. Averages? I'd say definitely bigger than either of the Mr. Averages but certainly nowhere the proportion of Mr. Zappa's. How about the angle of the jaw back there by the ears - or more accurately just under the ears? 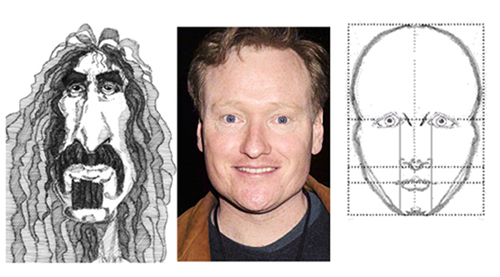 I'd say Conan has much more of a sharp angle than does Mr. Average. Here you can see the corners of the mouth come up a little on the narrow side (of course Conan's expression narrows his mouth even more, but if you watch Conan and look at other pictures I'll bet you'll come up with the same conclusion: his mouth is proportionately on the small side. The nose is on the narrow side too. Soo...draw the mouth small and the nose narrow (regardless of the length you make the nose). OK, here's the last little snippet of overall observations. Notice how Mr. O'brien's head keep's getting wider as you head up towards the hairline. Squint and look back and forth between Conan and Mr. Average. You'll see the square overall shape, the tall forehead, the angle of the jaw under the ears - and low at that. The Mr. Average head rounds off at the top and is much less angular around the corner of the jaws - in fact Mr. Averages entire face has more rounded curves. Big hair! High forehead; almost beady looking eyes, narrow nose with a slightly bulbed tip that pushes down onto the mouth, small mouth with narrow lips, strong jaw that's very squared. Strong cheekbones (made more obvious with shadowing) - which set the nose and mouth up to be made even narrower. Sum that all up and here's our man: . Stay cool those of you in the northern hemisphere, stay warm if you're south of the equator and all of ya's, keep on drawing!